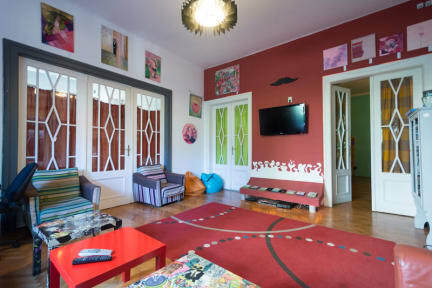 There are 3 shared dorms and one exquisite double room besides various common areas (living, chill-lounge, terrace and garden). The price also includes free coffee and tea all day long. No matter what is the purpose of your visit, our place has the perfect location: on the river bank, across the bridge from the fresh-market, close to the campus and universities and also to the city center. Die Ausstatung in diesem Hotel war wunderschön! Sehr viel Kreativität mit wiederverwendbaren Sachen. Ich würde gerne in diesem Hostel wieder übernachten. Nicest staff, the atmosphere was relaxing, the place was cozy and very clean. 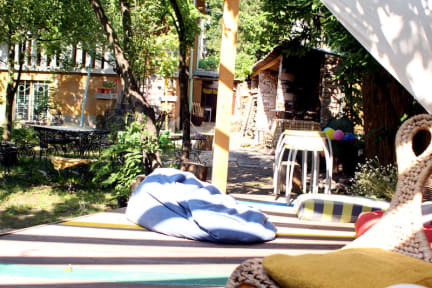 They also have a small, cozy backyard with terrace, where you can get to meet other travellers. I´ll definitely book it again next time I´ll stay in Timisoara. Das Hostel bietet supertolle Möglichkeiten zum relaxen und entspannen; der Garten ist ein absoluter Traum und bietet viel Raum um eine schöne Zeit miteinander zu verbringen. Ich hab mich wohl und sicher gefühlt, vor dem Eingang wachsen Weintrauben, was für mich ein tolles willkommen war! Absolute Empfehlung! One of the best hostels I've ever stayed in. The staff was so friendly and helpful from the very first minute, the house feels just like you share a home with friends. The house itself is more than awesome!!! Great style. The garden!!!! Like with Pippi Langstrumpfs Villa Kunterbunt :) they have a beer fridge... what alse should I add?! I had an enjoyable stay there. The staff was very friendly and helpful. The house is nice docareted, especially the garden has cool atmosphere to hang out. They also rental bikes, which is a nice way to get around Timișoara. Instead of Hostel Costel I was moved to Hostel Cornel in the city center.Both hostels are operated by the same management.I had a verry good time at the hostel thanks to the verry friendly and helpfull staff,the perfect location and the anemities and atmosphere of the hostel. The hostel (Cornel) is located in a historic building next to the city center. Für ein hostel ist es hier relativ ruhig, der Garten lädt zum relaxen ein. Tausend kleine Details sind im ganzen Haus zu entdecken, großartig :) der Fußweg in die stadt dauert ein wenig, ist aber durchaus machbar.